1949 Simplicity #2936 vintage sewing pattern, misses' cardigan jacket and wekit. The dart-fitted weskit, styled with a V neckline, has a front-button closing and slit at lower back edge. 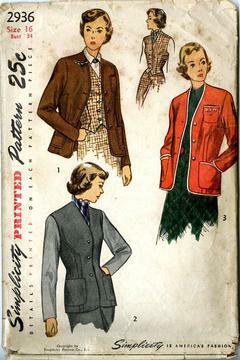 The long-sleeved jacket, trimmed with front pockets, has a cardigan neckline.